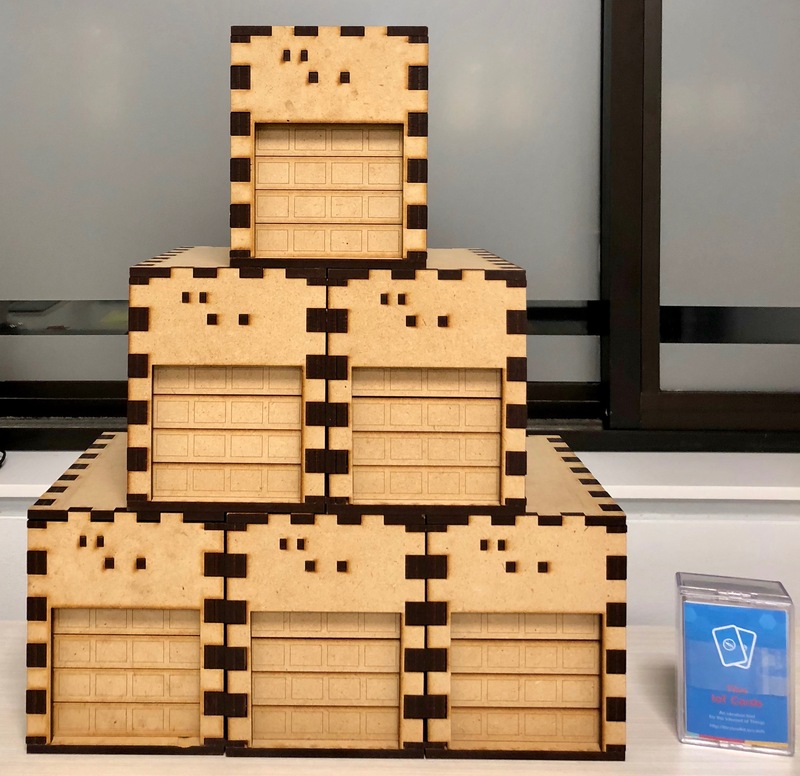 This project was created in an effort to create a real-world example project for my introductory IoT courses. Most importantly, it can be controlled by a Wi-Fi enabled platform, the Particle Photon. When the button is pressed the door opens/closes and the light activates. The light turns off soon after the door motion is stopped. Faults can be caused by either the electric eye’s beam being broken when closing or if the door physically stalls. In either case the door should stop (or reverse) and the light should blink. The door should be able to be restarted by pressing the button again. Follow-up assignments implement internet-based control of and feedback from the door. These include features that aren’t feasible on traditional garage door openers, such as notifications if the door has been left open. Stepper and Back Contact (Fully open contact). Photo looking up from garage floor. Front Contact (fully closed), Rotary Encoder (stall detect) and Traveller. Photo taken looking up from garage floor. Home automation aspects of IoT are appealing. 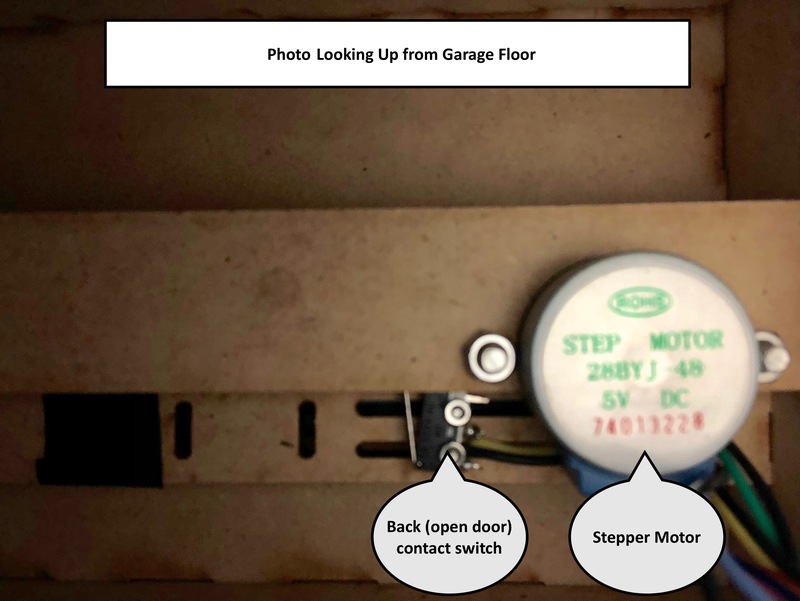 Garage door openers are relatively familiar devices. The I/O is digital, so it doesn’t distract too much from other topics. Like many more significant IoT projects, developers need to learn how to work with proxies for the hardware due to safety/space considerations. Moreover, APIs serve as contracts for hardware interaction. The mechanical aspects and timing characteristics make for a richer project. The scale is appropriate. Over the course of a semester it’s possible to put together a nearly commercial quality solution. Learn how to efficiently manufacture a small run of a product. They should be reasonably reliable. They’ll be used for a few semesters and poor performance undermines the experience. They should be portable. Developers (i.e., students) will only have access while in the classroom and the garages will be carried from table-to-table. They should be electrically and mechanically robust. Errors in code should not damage either the developer’s test platform (the student’s processors) or the mini-garages. Moreover, errors like this should be reported, rather than just quietly prevented. Developers should be able to make their code interact with the hardware with minimal effort. 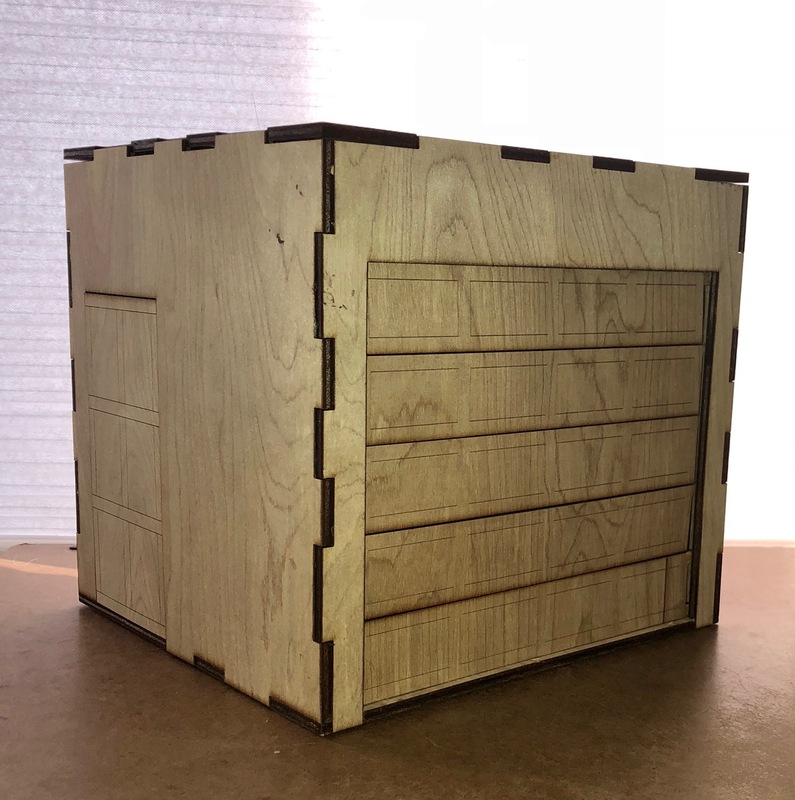 Given the requirements, I decided on something that’s approximately shoe-box size. A 1/24th scale was a good fit. The model is parameterized and many aspects of it will scale with a simple change to the scale parameter. The size of tabs on the box joints may need some adjustment and some elements, like the motors/gears/etc. are a set size and don’t scale. Consequently, modifications of scale often need some triage to get back to a working model and things go awry if the scale is significantly different than 1/24th. I chose a two processor design to help protect hardware and to require compliance with an API. 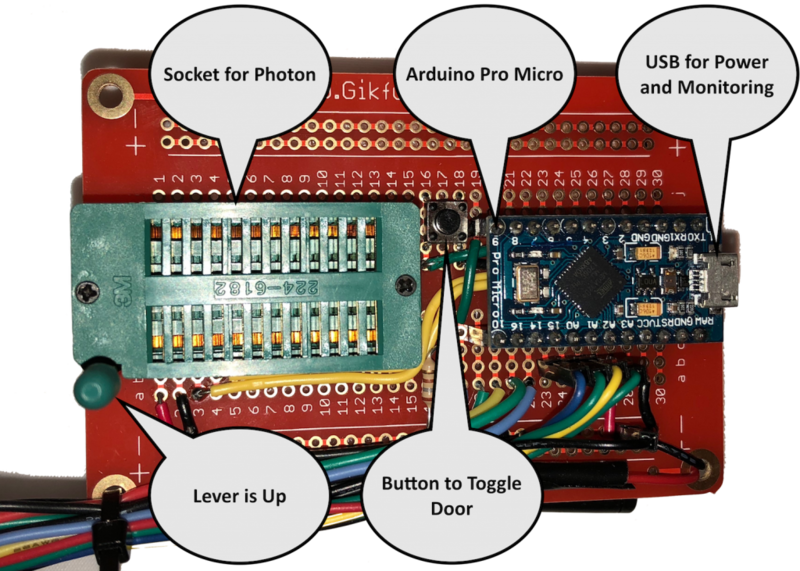 The students write code for a Particle Photon, which is then plugged into the garage hardware via a ZIF socket. It interacts with an Arduino Pro Micro, which does the real I/O. 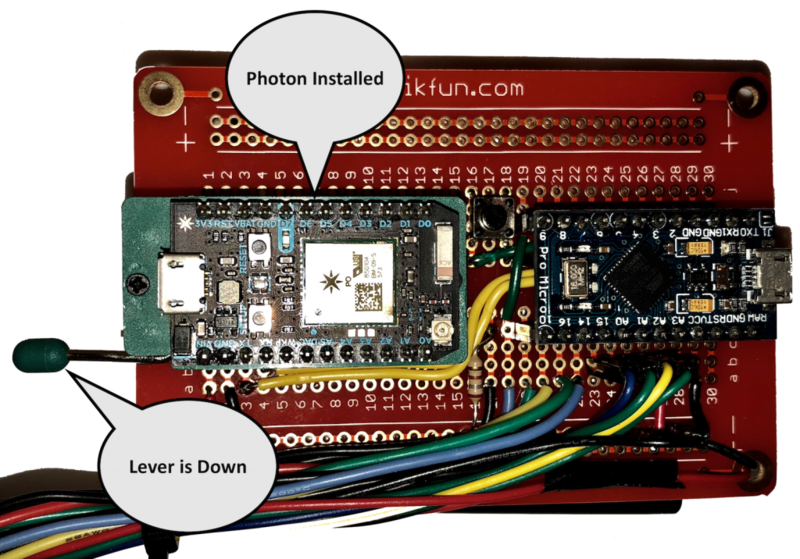 The only shared electrical connections from the Photon are power, ground, and RX/TX from a UART. This minimal interface helps avoid a wayward short-to-ground due to an accidentally misconfigured output. (RX/TX is relatively safe due to code review prior to using the hardware and because we don’t use that RX/TX for any other aspect of class. Circuits for other work only uses the DX and AX pins). When developing and testing code without the garage, developers use stubs for the API. 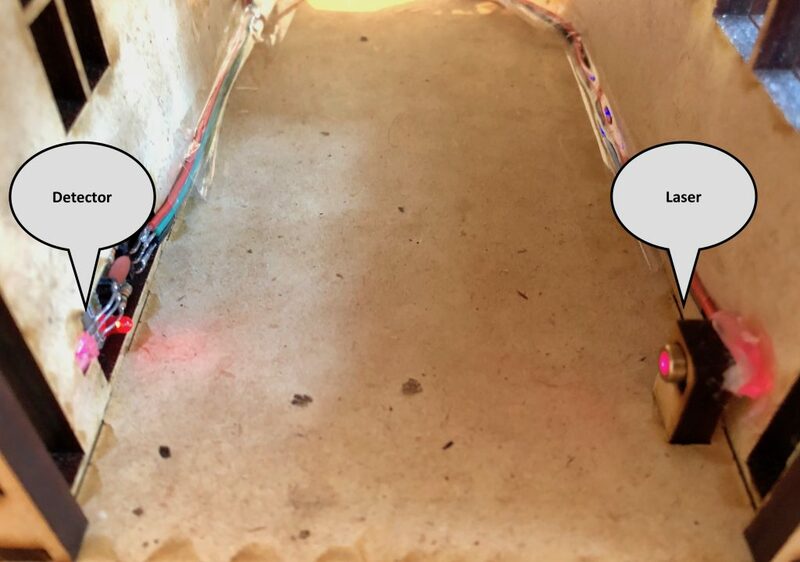 The stubs typically simulate the garage via LEDs and switches, which is sufficient for most testing. Some aspects of the assignments require meeting timing constraints, which requires code instrumentation as well. The motors (steppers) were chosen partly due to size and, largely, due to price and availability. 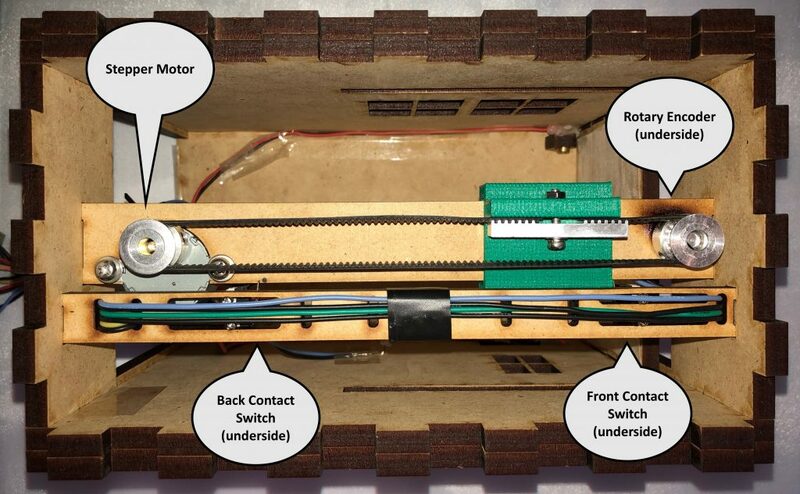 The choice of motors impacted both the technique for stall detection and the power requirements. Since it’s relatively difficult to detect stalls in steppers via changes in current, a mechanical rotary sensor on the front belt gear is used. If motion stops for a sufficiently long time it’s assumed that the door is stalled. 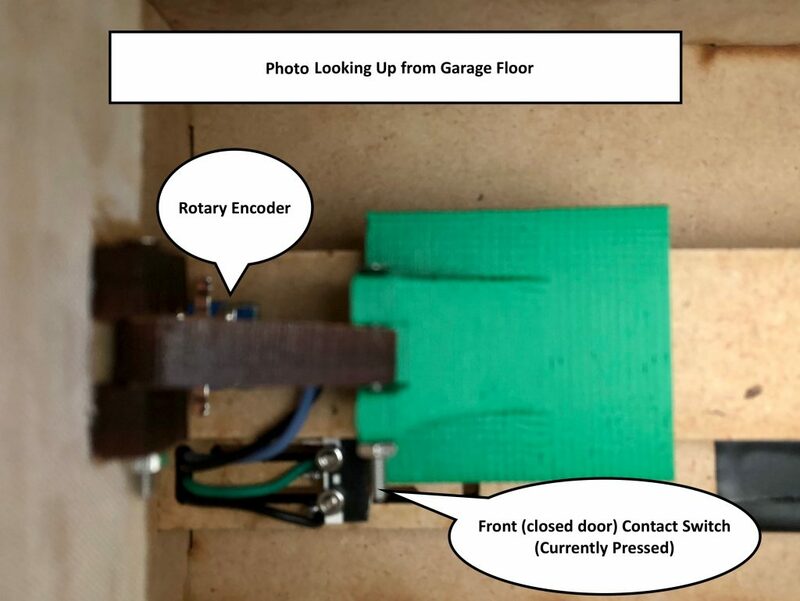 This technique has some limitations if the mechanical strength of the motor/belt can damage the mini-garage prior to a stall being detected, but fortunately this doesn’t seem to be the case. Typically the Arduino Pro Micro is connected via a USB cable to a PC, which monitors for errors. If the developer’s code attempts to overdrive hardware or misses timing constraints, it’s reported via a message. It was originally hoped that the USB cable could also satisfy all power requirements. Unfortunately the total current used by all components may exceed the current supplied by either of the Arduino Pro Micro’s on-board voltage regulators, which could lead to erratic performance. Rather than using a custom USB cable and additional power supply, I decided to just use an independent power supply for the motors (4AA batteries). Tooth picks: Misc. testing. These can be used for temporary pivots rather than screws.